Pioneers in the industry, we offer textile blades from India. 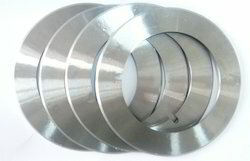 We have a wide range Textile Blades for textile and garment industry. These blades are designed in different varieties of lengths, widths and thickness for all machine brands and types of textile machines. Compatible with manual cutting equipment as well automated production lines, these blades are more efficient than straight grind, ensuring superior and cleaner cut.